56 Commercial Real Estate & Properties in Cairns City are listed in 2 categories. We have 31 OfficesSale & Lease and 26 Retail ShopsSale & Lease . Heritage Retail Shop For Lease Cairns Cbd Contact agent Helen Cross.. This landmark building is positioned on the corner of Spence and Lake Streets in Cairns CBD. Retail shop or office of 44 sqm Heritage influence with high ceilings Shop front on Spence Street high traffic zone Fully air conditioned Small kitchenette NBN connected ready for provider Amenities on site Contact: Exclusive agent Helen Crossley Ray White Commercial Cairns for more information. Orchid Plaza Shopping Centre - Shop For Lease Contact agent Scott Green..
Shop 9 Orchid Plaza is now for lease, located close to the Lake Street end of the complex. Wide frontage, carpeted, air conditioned and ready for tenant fit out. Lessor offering incentive package for a long term lease. Orchid Plaza is a very popular CBD complex and links Lake Street through to Abbott Street. The building is occupied by numerous tourist related tenancies and has 12 eateries within which generates good foot traffic flow. Contact: Exclusive agent Scott Green Ray White Commercial Cairns for more information. 50 Sqm For Lease Opposite Rusty's Market Contact agent Grant Timmi..
First floor space for lease in Public Trustee Building 25 27 Sheridan Street, Cairns Light and airy tenancy with great city views and vertical drapes for privacy Air conditioned Hardwood flooring Kitchenette Bathrooms in hallway Wide staircase One undercover car park included Contact: Exclusive agent Grant Timmins Ray White Commercial Cairns for more information. Cbd Office For Lease 58 Sqm With Views Contact agents Helen and .. The Conservatory Building in Lake Street is opposite Cairns Corporate Tower and runs between Lake and Abbott Streets. Attractive complex with a multitude of businesses including accountants, lawyers, consultants and property to name a few. 38 sqm approximately of office space on the first floor for lease. Open plan with kitchenette and has separate power and air conditioning. Contact: Exclusive agents Helen and Grant for more information. Orchid Plaza Shopping Centre - Office For Lease Contact agent Scott Green..
115 sqm newly refurbished office in CBD with three undercover car parks Accommodation consists of reception/waiting area, three offices including a boardroom, large open plan work area with modern kitchen and a store room New paint, LED lighting and natural lighting and ducted air conditioning Contact: Exclusive agent Scott Green Ray White Commercial Cairns for more information. 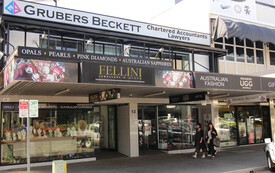 400 Sqm Space For Lease - Cairns Cbd Contact agent Scott Green..
400 sqm space near the corner of Abbott and Spence Streets. Has street frontage of approximately 10 metres. The building has good visibility and a high volume of pedestrian traffic passing by daily. Your neighbours in this popular tourist retail precinct would include OK Gift Shop, DFS, Louis Vuitton, JTB Travel, etc. All the usual services are provided internally including male/female toilets. External and under awning illuminated signboxes are available. A new opportunity now exists with competitive rental for a CBD space. Contact: Agent Scott Green Ray White Commercial Cairns for more information. Inner City Hair Salon And Nail Bar For Lease Contact agent Scott Green..
Shop 5A Orchid Plaza is now for lease on the ground floor near elevators, food and tourism retailers. Fully established hair salon and nail bar catering to locals and tourists with over 20 years trading history. Current owners wish to to move on. Lessor offering incentive package for a long term lease. Orchid Plaza is a very popular CBD complex and links Lake Street through to Abbott Street. The building is occupied by numerous tourist related tenancies and has more than a dozen eateries which generates good foot traffic flow. Contact: Exclusive agent Scott Green Ray White Commercial Cairns for more information. Inner City Hair Salon And Nail Bar For Lease/sale Contact agent Scott Green.. Fully established hair salon and nail bar catering to locals and tourists with over 20 years trading history. Current owners wish to to move on. Shop area is 44 sqm and on the ground floor of Orchid Plaza. All internal equipment is available. Shop is being offered on an "as is where is" basis with current staff also available if required. Reasonable asking price for business and rental is affordable. Contact: Exclusive agent Scott Green Ray White Commercial Cairns for more information. Shop For Lease - Orchid Plaza Contact agent Scott Green.. Fully established Japanese sushi restaurant with 20 years trading history available as the current owners wish to move on. Shop area is 103 sqm in the food court of Orchid Plaza on level 1. The shop also has an external balcony overlooking Abbott Street and south to the Casino. The shop is being offered on an "as is where is" basis with the current staff also available if required. Contact: Exclusive agent Scott Green Ray White Commercial Cairns for more information. Inner City Restaurant For Lease/sale Contact agent Scott Green..
Cbd Retail For Lease - Orchid Plaza Shopping Centre Contact agent Scott Green..
Shop 24 Orchid Plaza is now for lease, located close to the Abbott Street end of the complex. 113 sqm with rear storeroom and staff toilets. Wide frontage, carpeted, air conditioned and ready for tenant fit out. Lessor offering incentive package for a long term lease. Orchid Plaza is a very popular CBD complex and links Lake Street through to Abbott Street. The building is occupied by numerous tourist related tenancies and has 12 eateries within which generates good foot traffic flow. Contact: Exclusive agent Scott Green Ray White Commercial Cairns for more information. 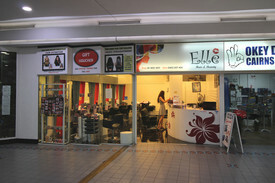 40 Sqm Retail Shop For Lease Cbd Contact agent Scott Green..
40 sqm existing retail shop for lease in Oceana Walk. Join other retailers such as The Crystal Caves, Zambrero's, Games Workshop, Earth Toys and Blackbird Cafe to name a few, in the beautiful Oceana Walk arcade. There's lots of passing foot traffic from existing tenants, people walking through from both Lake and Grafton Streets ends and the arcade's central CBD location. Close to Woolworths, Commonwealth Bank and Orchid Plaza and next to Kathmandu and Westpac Bank. The tenancy has air conditioning and glass shop frontage onto the arcade. Only 5 minutes to Cairns Port, Trinity Inlet and 10 minutes to Cairns Airport. Contact: Exclusive agent Scott Green Ray White Commercial Cairns for more information. Well Appointed Tenanted Offices In Small, Popular Complex In Cairns Cbd $330,000 FOR BOTH! 2 well appointed level 1 offices (100m²) in small, popular complex located on Grafton Street, Cairns CBD. Currently leased to long term tenant (6yrs+) AUS Mining Personnel Services until 30th June 2020 (wanting to renew) Rent: $30,956 p/a + gst Outgoings: Body Corporate: $6,691 (including insurance) p/a Rates: $2,816 p/a Priced at $330,000 going concern. Call Billy on 0407 102 103 for further details and/or top arrange an inspection. 13 Spence Street, near the corner of Abbott Street. 190 sqm first floor office available facing Spence Street. Near prominent retailers, corporate offices and tourism users. The office suite is individually air conditioned, has excellent natural light, suspended ceiling, lights and carpeted floor. It comprises a reception, four partitioned offices, a larger open work area, kitchen and male and female toilets. Currently leased on a monthly basis, ideal for owner/occupier or as an investment. Priced to sell at $500,000 (plus GST if applicable). Contact: Agent Scott Green Ray White Commercial Cairns for more information. High Grade Office Available-300 Sqm Contact agents Helen and ..
CBD office located in the attractive The Conservatory Building, 9 Abbott Street High quality fit out formerly PNG Consulate Walk through access Abbott to Lake Streets First floor office approximately 300 sqm with 3 entry points Two reception points, both with waiting areas 10 separate offices Two offices with built in, modern desks and drawers One boardroom designed with data connection points One meeting room Modern kitchen Neutral colours throughout Two air conditioned data point rooms LED sensor lights in the non common areas Built in speaker system installed Male/female/disabled toilets and shower all included Ample storage areas with built in cupboards On street metered parking Contact: Exclusive agents Helen Crossley and Grant Timmins for more information. 47 Sqm For Lease - Lake Street Contact agent Scott Green..
47 sqm shop available for lease with direct street frontage at 52 Lake Street, Cairns City. In the very centre of the CBD between busy Orchid Plaza and the well known Boland Centre. Suit retail or possible food retailers with wide footpaths for outside dining. Numerous other food retailers trade in the immediate area. The shop has its own internal toilets. Surrounded by quality retailers including Woolworths, Westpac Bank, Commonwealth Bank, Kathmandu, Zambrero's and a multitude of popular eateries. Contact: Agent Scott Green Ray White Commercial Cairns for more information. The Conservatory Building - Office Suite Available For Lease Contact agents Helen and ..
65 sqm of office space. Three separate areas. Main office manager's office is 15 sqm approximately. Reception/waiting room and kitchenette is 28 sqm approximately. Long office with sliding door entry is 22 sqm approximately. In an attractive complex with a multitude of businesses' including lawyers, consulates and property to name a few. Contact: Exclusive agents Helen and Grant for more information. This office level of Orchid Plaza has been re furbished with final touches still to come. Accessed by high speed lift from basement car parking or ground floor It is well sized and located in the office level above the food court level in busy Orchid Plaza Shopping Centre in the heart of the CBD. This area is the only small office space available and will be fully refurbished. Situated opposite the new office of China Southern Airlines. Basement parking available at $1,656.00 + GST per annum. Contact: Exclusive agent Scott Green Ray White Commercial Cairns for more information. Professional Office Suite Available For Lease Contact agents Helen and .. The Conservatory Building F14F15/12 14 Lake Street, Cairns City 105 sqm office space available on first floor Featuring six office spaces (ranging 6 sqm 12 sqm) Kitchenette/tea room Large boardroom @ 18 sqm Reception/foyer/waiting room @ 14 sqm Ducted air conditioning Suit business professionals/medical consultants Minimum one year lease Contact: Exclusive agents Helen and Grant Ray White Commercial Cairns for more information. Cdb Gym Fully Equipped - For Lease Contact agent Scott Green..
On the south side of Lake Street near office buildings and hotels, is a fully equipped gymnasium (formerly Performex Gym) available for lease. The current tenancy size is 824 sqm and comprises three areas of 476 sqm, 251 sqm and 97 sqm. All or part of the tenancy can be leased. There are toilets in two of the three areas and showers are in the main gym area. All equipment is fully functional and modern and will form part of the lease agreement. Opportunity exists for industry related persons to enter a business with little initial capital outlay. Lessor has reduced the asking price. Contact: Exclusive agent Scott Green Ray White Commercial Cairns for more information. Grafton Street Office For Lease 85 Sqm - Solander Centre Contact agents Helen and ..
Professional office suite for lease in the popular Solander Centre Large open plan work area with separate large office of approximately 14 sqm Double entrance doors to the unit with kitchenette Currently furnished but can be tenanted without see photos Fully air conditioned One allocated undercover car park included at the rear of the building Lessor incentive of one month free enquire today Contact: Exclusive agents and Helen and Grant Ray White Commercial Cairns for more information. Shop 24 Orchid Plaza is now for lease, located close to the Abbott Street end of the complex. 113 sqm with rear storeroom and staff toilets. Wide frontage, carpeted, air conditioned and ready for tenant fit out. Lessor is offering an incentive package for a long term lease. Orchid Plaza is a very popular CBD complex and links Lake Street through to Abbott Street. The building is occupied by numerous tourist related tenancies and has more than a dozen eateries which generates good foot traffic flow. Contact: Exclusive agent Scott Green Ray White Commercial Cairns for more information. Cbd Shop For Lease Contact agent Scott Green..
52 Lake Street 140 sqm shop available for lease with direct street frontage. In the very centre of the CBD between busy Orchid Plaza and the Boland Centre. Suit retail or possibly food retailer with wide footpaths for outside dining. Numerous other food retailers trade in the immediate area. Shop has its own internal toilets. The building is surrounded by quality retailers including Woolworths, Westpac Bank, Commonwealth Bank, Kathmandu, Zambrero's and a multitude of popular eateries. Contact: Agent Scott Green Ray White Commercial Cairns for more information. Cairns City Cbd For Lease Contact agent Scott Green..
At 52 Lake Street is a 92.5 sqm shop available for lease with direct street frontage. In the very centre of the CBD between busy Orchid Plaza and the Boland Centre. Suit retail or possible food retailers with wide footpaths for outside dining. Numerous other food retailers trade in the immediate precinct. The shop has its own internal toilets. Surrounded by quality retailers including Woolworths, Westpac Bank, Commonwealth Bank, Kathmandu, Zambrero's and a multitude of popular eateries. Contact: Agent Scott Green Ray White Commercial Cairns for more information. Approved Education Facility Or Corporate Offices - 966 Sqm Contact agent Scott Green..
Full floor plates available for lease at 67 Lake Street, Cairns City. In the very centre of the CBD, the building is surrounded by corporate offices, university's, education facilities and retail shopping and is just 200 metres from Cairns major bus transit centre. Previously an International Language School, the building has CRICOS approval. Each floor is fully partitioned and has male and female toilets and all floors could easily be modified to suit individual requirements. Favourable leasing incentives are available to quality, long term tenants. Shorter lease periods could also be available on request. Contact: Exclusive agent Scott Green Ray White Commercial Cairns for more information. Approved Education Facility Or Corporate Offices - 530 Sqm Contact agent Scott Green..
Full floor plates available for lease at 67 Lake Street, Cairns City. In the very centre of the CBD, the building is surrounded by corporate offices, university's, education facilities and retail shopping and is just 200 metres from Cairns major bus transit centre. Previously an International Language School, the building has CRICOS approval. Each floor is fully partitioned with male and female toilets and all floors could easily be modified to suit individual requirements. Favourable leasing incentives are available to quality, long term tenants. Shorter lease periods could also be available on request. Contact: Exclusive agent Scott Green Ray White Commercial Cairns for more information. Approved Education Facility Or Corporate Offices - 265 Sqm Contact agent Scott Green..
Full floor plates available for lease at 67 Lake Street, Cairns City. In the very centre of the CBD, the building is surrounded by corporate offices, university's, education facilities and retail shopping and is just 200 metres from Cairns major bus transit centre. Previously an International Language School, the building has CRICOS approval. Each floor is fully partitioned with male and female toilets and all floors could easily be modified to suit individual requirements. Favourable leasing incentives are available to quality, long term tenants. Shorter lease period could also be available on request. Contact: Exclusive agent Scott Green Ray White Commercial Cairns for more information. Approved Education Facility Or Corporate Offices - 255 Sqm Contact agent Scott Green.. 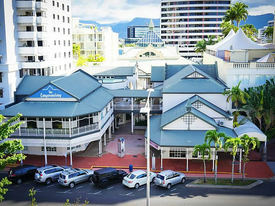 Available office space in the iconic 'Cairns Square' building, right in the heart of Cairns CBD. This spacious suit is located on level 2 (there are lifts) and overlooks Abbott & Shield streets. Approximately 95m² equipped with kitchen, dishwasher, NBN internet. Outgoings to be paid by tenant: $7,150+gst per annum, payable in monthly instalments. Owner is flexible with lease length and lease terms. Call our friendly staff on 07 4037 9379 to make an appointment.